"The cruelty law makes it a crime to overdrive or overload an animal; deprive an animal of necessary sustenance; inflict unnecessary suffering or pain on the animal; or unnecessarily fail to provide the animal with nutritious food in sufficient quantity, necessary veterinary care, proper drink, air, space, shelter, or protection from the weather. Such action constitutes a 90 day/$1,000 misdemeanor." 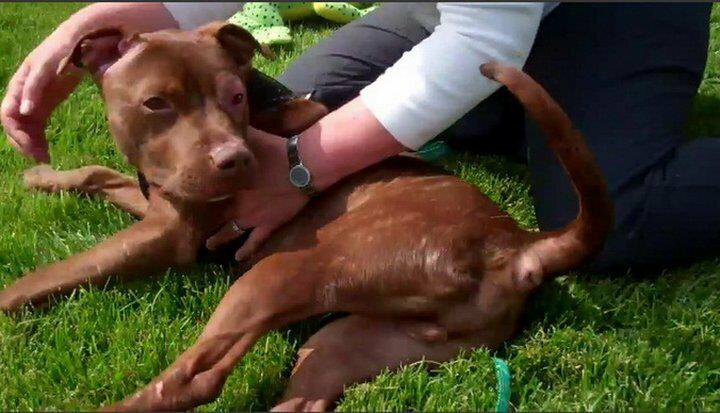 On March 16, 2011, Patrick, a 2-year-old dog, was found wrapped in trash bag, clinging to life at the bottom of a 20-story trash chute in Garden Spries Housing Complex located in Newark, NJ. Patrick required over an hour of emergency treatment at the scene before being rushed to the American Humane Society (AHS), Newark, NJ. Dr. Buonjoira was the first veterinarian to treat Patrick and she's since reported on Channel 12 News that she's never seen a more abhorrent case of starvation and abuse. The staff at AHS was unable to determine his temperature, due to his excessive wasting. His 20 lb body revealed several pressure sores, excessively long nails, white gums and numerous physiological conditions. He was subsequently moved to a trauma facility, Garden State Veterinary Services, where he embarked upon the slow process of weight gain and muscle strength through routine nourishment, humane care and enjoying the kindness and support of humans. While Patrick suffered excrutiating pain and sufferage from several months of being withheld food and water, his plight would not be in vane. His daily battle to survive would provide tens-of-thousands with a greater purpose. Patrick's plight caused the many to not turn the other way, but to address the issue of legislative intervention, public awareness/education and increased criminal penalties relative to animal abuse, cruelty and torture. Through his courage and will to survive, a world was awakened and a remarkable movement begun. The Patrick Movement is sweeping across the country, and is devoted to create widespread and long-awaited change for all the Patricks. Our efforts are humane, necessary, and we welcome you to be a participant for the hundreds of thousands, if not millions of Patricks. We must hear their cries and no longer look away and address the issue of animal abuse, as it's a proven fact that those who intentionally hurt animals don't stop there. Case studies have clearly demonstrated animal abusers suffer from levels of mental disorders and/or abuse themselves. It's not just about an abuser serving jail time, but rehabilitative processes should occur. The Patrick Movement is comprised of 50 individual, state Facebook pages created to address the critical need to work with local legislatures, animal control personnel and local officials for the strengthening of animal cruelty laws and statutes at a local level. Neither Patrick's Movement Maryland (nor any of the individual state Patrick Movement pages) are supported by financial donations in any manner. Myself and all of our members generously donate our time, acumen and passion and are in it for the long haul. We invite and encourage your support in fighting against animal abuse. We would like to educate the public on the responsibility of having a pet and make sure they understand the proper care that particular pets require. Kittens become cats and puppies become dogs. This is one thing so many people fail to realize. The care for a puppy is very intense and needs to be done with love and patience. Our Maryland shelters are full and animals are euthanized daily. Spaying and neutering your pet is a must, not only to avoid pregnancies; but altered pets are healthier and live up to 2 years longer than unaltered pets. Proper knowledge in determining rules within and outside the home is also necessary for a well-balanced pet and pet guardians. It's our hope to decrease companion animal mortality in the state of Maryland, and we encourage all Marylanders help. Click to join Patrick's Movement on Twitter! Patrick’s Movement MD, is THE source to view ongoing, national & local initiatives! Please come, "LIKE" and participate - Your voice counts!! A starving, moribund dog we named Patrick captivated the hearts of thousands. He was the worst living victim of human depravity that not only shocked us, but shocked people throughout the world. Patrick's story has angered people as no other act of cruelty has done. The Associated Humane Societies took him in and Dr. Lisa Bongiovani made the decision to try to bring life to this dog. He was as close to death as a living thing could be when he entered our shelter. The race to save his life was done with the purest of intentions. His slow progress was followed after he made it through that first critical night ... and the next and the next. He has touched the hearts of many; to gain awareness and to make way for the changes in the manner in which people perceive animals and treat animals. An emaciated dog named Snoopy in Wisconsin - whose picture looked exactly like Patrick - died alone. There was no fanfare, no huge outcry - so Patrick must be the one to carry the tale of animal abuse throughout the land. He has put a real face on the issue of animal abuse. Even Sophie, (right), who is a canine companion to Marie Nolan of Minnesota, is using Patrick’s sad story to emphasize the need for stronger laws. As we have stated before, "no good deed goes unpunished" and that holds true for the efforts of Associated Humane Societies and Patrick. We were on a quest to save this dog who had the will to survive the slow starvation and the fall from a 19th floor garbage chute. Through it all, it never seemed possible that this would have become a cause celebre -- and we ask you to understand that our goal from the very beginning was only to save him from death. Somewhere along the way, several people have come forward to advise that Patrick was their dog -- he was stolen, ran away, etc. etc. One of them advises that they have contacted an attorney. We have not revealed this information previously, but it is a piece of information that we must deal with in the not-too-distant future. The number of internet sites has steadily grown as are the number of people selling "Patrick" items or using it to solicit funds for their own use. We are being criticized for having to "own" Patrick's likeness by a trademark. The Society is now receiving numerous e-mails requesting permission to sell t-shirts, posters, keychains, ad nauseum, requests for adoption and more. We are physically unable to answer the thousands of e-mails we receive, so we hope this will suffice for now. Patrick is going through surgery; When he is through with that, he needs care for demodectic mange, physical therapy for weak rear legs, perhaps some swimming therapy -- a new adventure for this dog. He cannot nor should he remain as an occupant of a veterinary hospital where he needs no more veterinary care. Society staffers visit at least twice (and sometimes more) daily and he has formed friendships with many at the hospital and just as loving and acceptance of AHS staffers. And what is next for Patrick?? As soon as he is completely on his feet, healthwise, we will him evaluated by our wonderful professional temperament tester that evaluates all our pit bull terriers and Rottweilers. This will help determine what kind of home Patrick will truly thrive in. Time will tell, but he is soaking up all the love, the attention ... and the treats that anyone/everyone dotes on him. There are many websites that have lambasted us – for what? For rescuing a skeletal stray that we tried to save – not knowing if he would survive or become so popular that everyone wants a piece of him; people want to raise money in his name for whatever purpose they have – which is certainly not us. We could never have known what a symbol Patrick has become. And to tell us what to do with him. His legacy of love goes far beyond what anyone can imagine. We are contacting the Citizens' Stamp Advisory Committee to propose a stamp for Patrick. The Committee's primary goal is to select subjects of broad national interest that are interesting and educational. If approved several million stamps are printed for the public's use. This story and the legacy is bigger than t-shirts or keychains, etc. We hope that you will understand and accept our thoughts and plans for the future.